The bi-weekly budget planner template helps you keep track of your income sources, your home expenses, health expenses, insurance, savings, obligations such as student loans, and other miscellaneous expenses. If you receive your salary on a bi-weekly basis, a bi-weekly budget planner template can help your create a budget that is molded to your pay cycle. The bi-weekly budget planner template helps you keep track of what bills you have paid and what bills need to be paid. For instance, your rent is due on the fifth of every month. If your pay day lands on the second, your rent goes into the bi-weekly budget that covers that pay check. If your insurance payment is due on the twentieth, that expense goes into the estimate column another bi-weekly budget planner template. In that same template, you can put your rent in the paid column, because you have already paid during the first budget of the month. 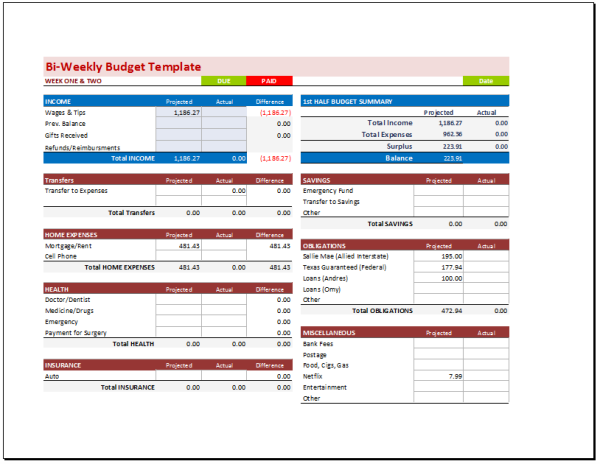 The bi-weekly budget planner template keeps you on top of your personal finances. It is more comprehensive than a monthly personal budget template. Download your template today.